In this month's US stock market outlook, we will study the charts and evidence to see what we can expect for the month of October. We will analyze the major indexes and the different sectors and come out with an objective view of what the stock market is likely to do. It is important for the trader and investor to be objective and look at the facts rather than be subjective and have our own personal opinions. One good way is to look at the charts of the major indexes and study the trends. 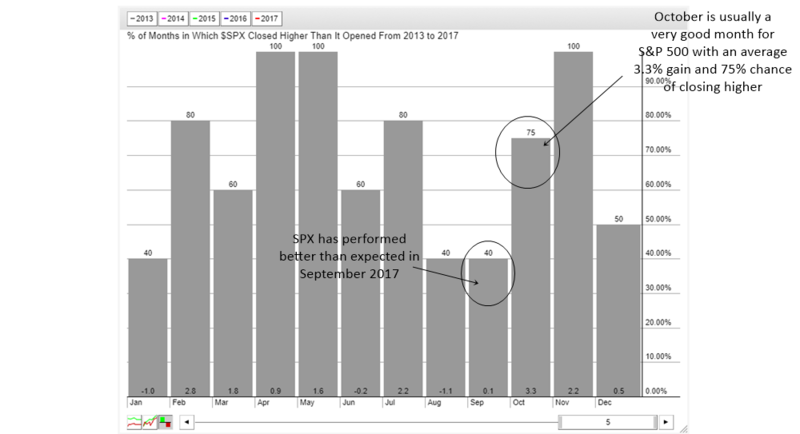 So far, the S&P 500 has performed better than expected for the month of September by closing about 2.3% higher when the average performance of the S&P 500 for the past 5 years is about 0.1%. The S&P 500 has a 40% chance of rising in September for the past 5 years but this year, the S&P 500 has perform spectacularly well. 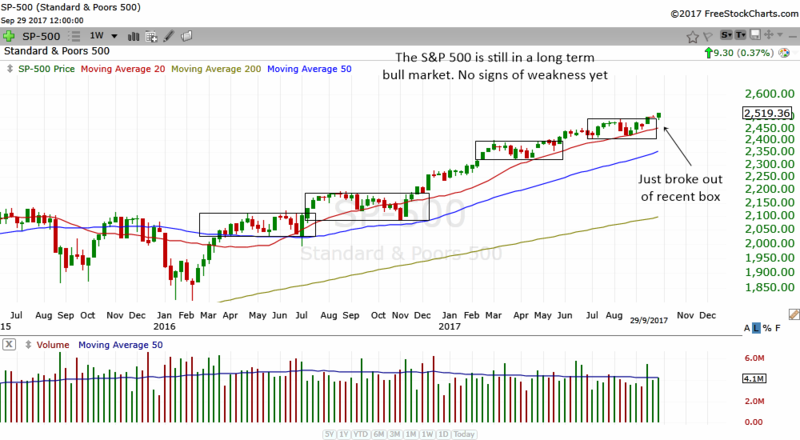 Perhaps it is because of the strong uptrend in the S&P 500 and the confidence in the economy. Donald Trumps' target of 4% growth is no longer a dream as the US economy is able to reach a 3% growth. The S&P 500 index and the Dow Jones have performed better than expected for the month of September 2017. 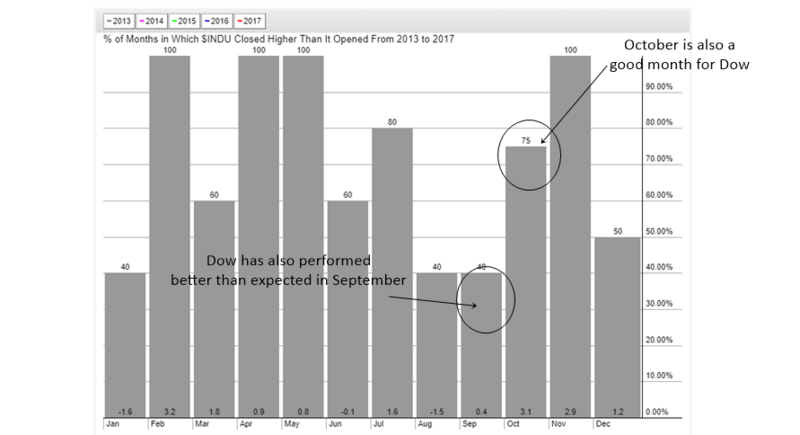 The Nasdaq has performed as expected and closed higher for the month of September. 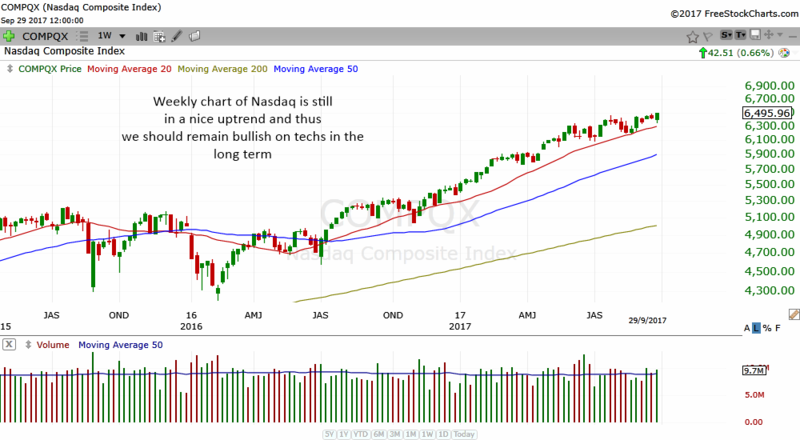 Despite the drop in Apple and the correction in the Nasdaq, the techs quickly followed the seasonality script and rose higher in the last week of September. We have correctly anticipated the rise of the Nasdaq index when it entered into an oversold stochastics reading. Do follow my Daily Stock Market Analysis for day to day analysis of the stock market. The chart above shows the seasonality chart of the S&P 500 index. If you look at the months of October and November, they are very conducive for the bulls. 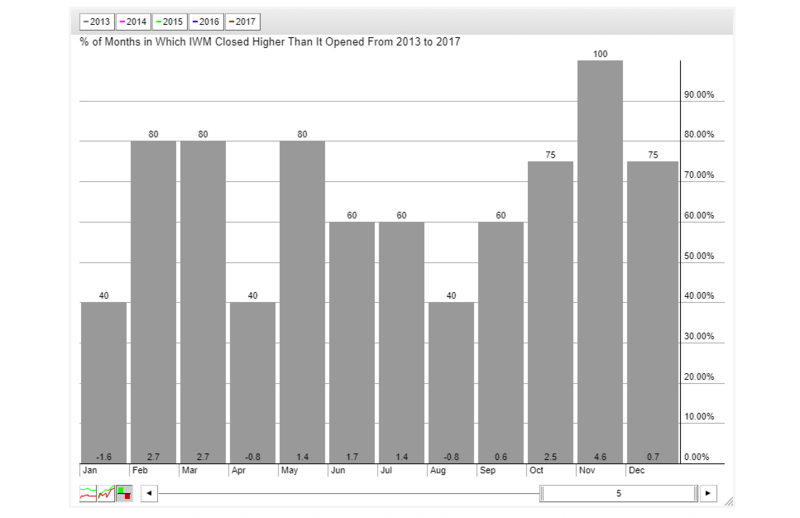 For the past 5 years, the S&P 500 has closed higher 75% of the time for the month of October with an average gain of 3.3%. The index has also closed 100% higher in November with an average gain of 2.2%. It is important for the trader to note that seasonality charts are secondary to trend analysis and price action analysis. But when you find that price and trend agree with seasonality charts they can often give the trader an edge in knowing how things will turn out for the market. Some traders can use them to spot the bottom of corrections as well. October and November are also conducive times for Dow bulls. 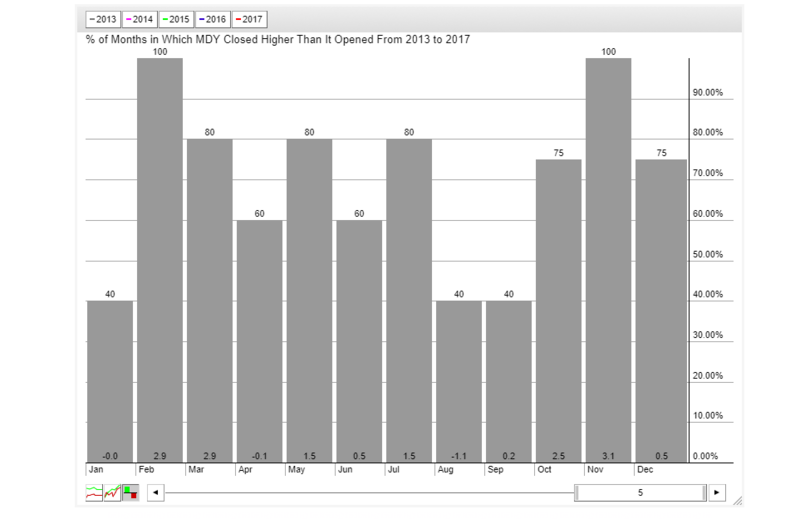 Dow has closed higher 75% of the time in October and went up higher 100% of the time in the month of November. 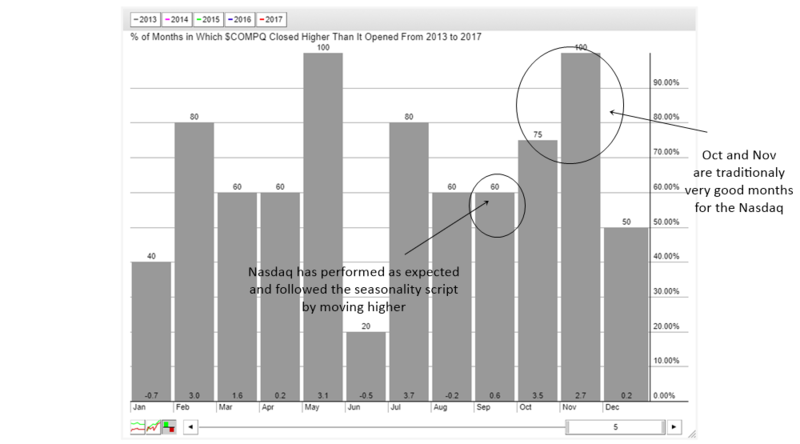 The seasonality chart of Nasdaq Composite also tells us that the month of October and November have been historically good for the index in the past 5 years. When you look at the seasonality charts of the S&P 500, Dow Jones Industrial Average and the Nasdaq Composite Index, you can be confident that there may be good rallies in the months ahead. So, we anticipate bull runs during the end of the year. Now that we have had a glimpse to the historical performance of indexes according to the month, we will then study the price action of the main indexes to aid us even more. I have attached the seasonality chart of IWM (small caps) and MDY (Midcaps) below. If you look at them, they point to conducive environment for bulls in the 4th quarter. This means that the small caps and midcaps will likely perform well in these 3 months. The IWM has already broken out higher and it really had a very very impressive run up in the month of September. The weekly chart of the S&P 500 index above shows us that the stock market is still in a very bullish long term bull market. The index is above its rising weekly 20 MA, 50 MA and 200 MA. This is a picture of a strong bull market and there is no weaknesses at all in the stock market for now. The trend is your friend as they say and therefore we continue to stay bullish in the long term and we will not change our mind about the bullishness of the stock market. The boxes that I have drawn on the weekly chart are strong support areas. To learn about the importance of these congestion boxes, I suggest that you read one of my latest post, Nicolas Darvas Box Method Chart Pattern. These congestion box areas are strong support areas and they will act as good support in the event that the S&P 500 index drops. So far the bears have not even been able to seriously challenged the top of any box. Therefore, we can say that the bulls are firmly in control and they are much much stronger than the bears. So I suggest that you ignore any doom and gloom reports from newsletter writers for now. Sure they may be corrections but the message that the charts are telling us is to stay bullish and remain optimistic unless the trend changes. As I said earlier, the trend is your friend and you should agree with it until the trend changes. So far there is no sign of a trend change. Let us now look at the daily chart of the S&P 500. When we zoom into the S&P 500, we can see that the smooth rise that is portrayed in the weekly chart is not that smooth at all in the daily chart. There are indeed nice rallies but they are often followed by painful corrections that will hit the account of the average investors. This is very very healthy as the highs and congestion areas are now strong support areas as well. I have drawn 2 nice support areas which will keep any correction in check. Recently, the S&P 500 also broke above a new box. This is an important development as we enter into the month of October. A box is an area of battle between the bulls and the bears. So this means that the current battle is being won by the bulls. The more it rises the better it will be. The box area will also act as a support area in the future if there is any correction. So what do you do when the stock market is in an uptrend? The trader should buy the dips to support areas. They can also buy the breakouts above a downtrendline or breakout higher from consolidation areas. 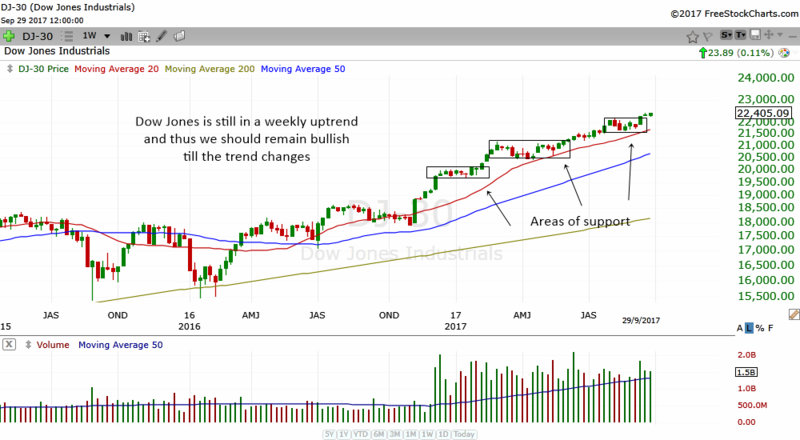 The weekly chart of the Dow Jones Industrial Average above shows us that this main index is still in a very bullish long term uptrend. A series of higher highs and higher lows and staying above its rising 20 MA, 50 MA and 200 MA is a clear sign that we should still be bullish on the US stock market. I have drawn some boxes on the chart which shows potential support areas. If there is a correction or a drop, it won't be that easy for the bears to be in control. Support areas on long term charts are very good at keeping the index from dropping. Meaning, they are not easy to overcome. When we look at the daily chart of the Dow Jones Industrial Average, we can see that Dow is giving us a picture of bull strength. It is slowly drifting higher and higher. There are ample support areas below and currently it is trying to breakout of another smaller box. Taking a measured move target, we can anticipate how high the Dow can go. It might or might not breakout but with the months of October and November so conducive to the stock market, the stock market might just be able to achieve that target. The weekly chart of Nasdaq above also paints the same strong bullish picture like the Dow Jones and the S&P 500 index. A series of higher highs and higher lows and moving at a 45 degrees angle is a picture of bulls strength. You don't want to be bearish on the indexes when they are making a 45 degrees angle chugging higher slowly. 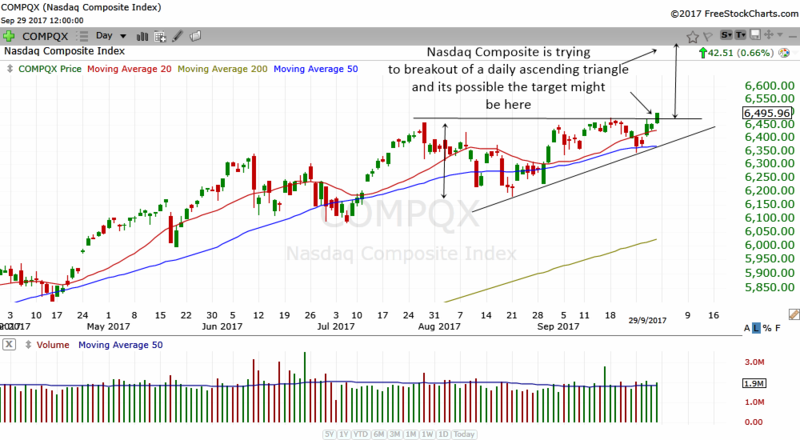 The Nasdaq Composite has actually broken out of an ascending triangle in the daily charts and printed an all time high. This is just amazing. The ascending triangle is a bullish pattern especially if it is happening in an uptrend. When this pattern happens in the index, it tells us that the bull market is very likely to continue. The whole pattern is a struggle between the bulls and the bears with the outcome of it being won by the bulls. 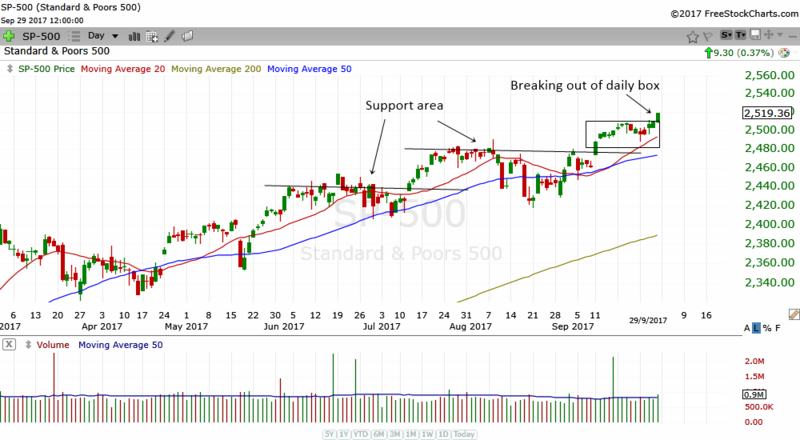 The top of the pattern will become a new support area as the index rises higher. So, any correction will most likely find support and bounce higher from there. We can put a target by taking the height of the pattern and projecting it from the breakout. You can see that the target is off the charts. I won't be surprised that the target will be met in the near future. When an index is in an uptrend, the odds of it moving higher is very good. There is always a fear that the rise in the stock market is only specific to certain stocks. That means that the bull market is only happening because a few select big stocks are pushing the index up. In order to ascertain whether the bull market is genuine and if there is a broad participation in the bull market, we need to look at the small caps as well as the mid caps. I like to use the IWM ETF to gauge the participation of small cap stocks. The chart above is the weekly chart of IWM or iShares Russell 2000 Index Fund ETF. I have highlighted in the past that the IWM was oversold in the weekly stochastics and it was hitting the weekly 50 MA and we could expect a bounce up. The IWM did find support there and bounced up. The move back up was so strong that it overcame resistance and broke above a weekly box. Those who like to use the MACD will also notice that the MACD Histogram is crossing back above 0 and that is a bullish buy signal. Therefore, it is very likely that the small caps will move higher in the future. Even if there is a correction, the top of the box will act as support to it and will most likely enable the small caps to bounce up from there. 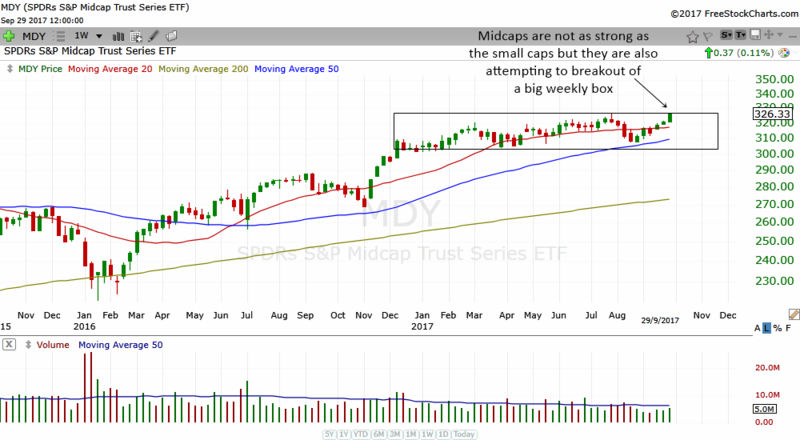 The weekly chart of the Midcap ETF above also shows that the MDY is trying to breakout of a weekly box. 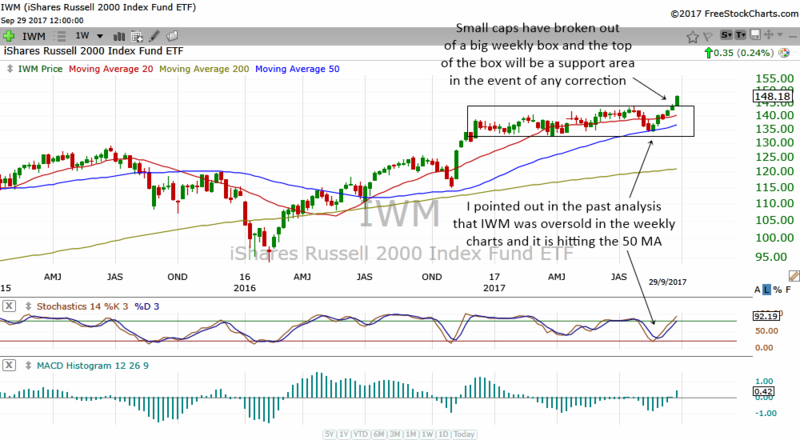 The very fact that IWM has broken out of a weekly box and the MDY is moving higher shows that the participation in the bull market is very broad and not restricted to only big companies that make up the bulk of the major indexes. Broad participation tells us that small cap companies and mid cap companies are also benefiting from the current economic environment. If you look at both charts above carefully, you will also notice that they are both in a weekly long term uptrend. Therefore, as investors and traders, we should continue to be bullish on the US stock market as a whole. The performance of different sectors will also help to support the case of a bull run or a bear market. Sometimes, certain sector may give us hints that the market may be weak internally. When I look at some of the different sectors of the US stock market, I do not see any weakness at the moment. First of all, let us take a look at the semiconductor index. The chart above shows the daily chart of SMH. 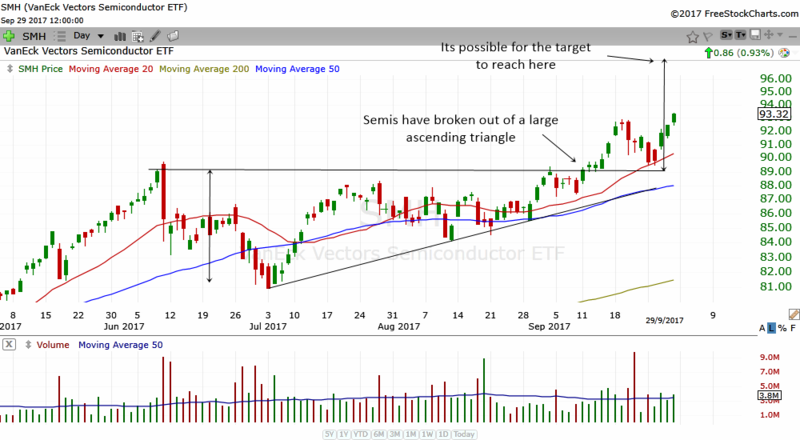 When the semiconductor sector leads the market, it is usually a very good sign that the US stock market will go higher. From June to August 2017, the SMH had some very wide whippy movements which gradually converged to form an ascending triangle pattern. It then broke out of the pattern and confirmed to us that the stock market is very healthy. There was a slight correction after it broke out but the SMH quickly found support at the top of the pattern. If we take the projected target, the near term target is north of 96.00. Semis that lead the market are a good sign of better things to come. Next, we look at the financial sector. The chart above is the weekly chart of XLF which represents the financials sector that are mostly made up of banks. A bull market with a rising XLF is usually a good sign of better things to come. If you look at the weekly chart, you will notice that the XLF is making higher lows and same highs. 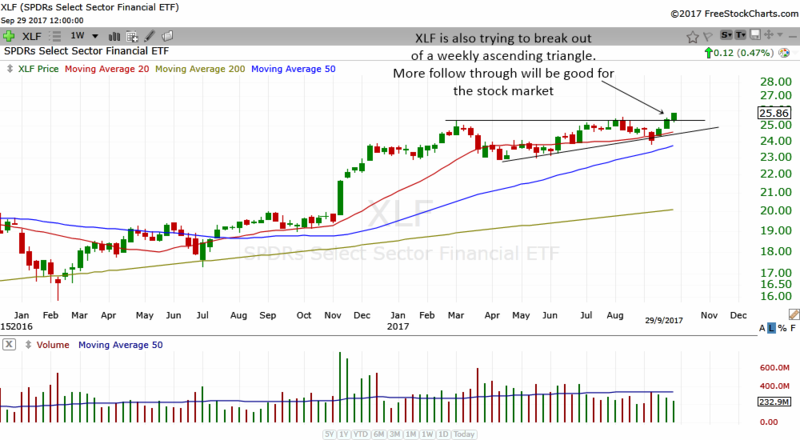 The XLF is breaking out of an ascending triangle in the weekly chart. The fact that it is making higher lows mean that the financial sector is refusing to go lower. Which also means that it wants to move higher. The more it moves higher, the top of the pattern will act as the new support for XLF. The chart above is the daily chart of XLF. 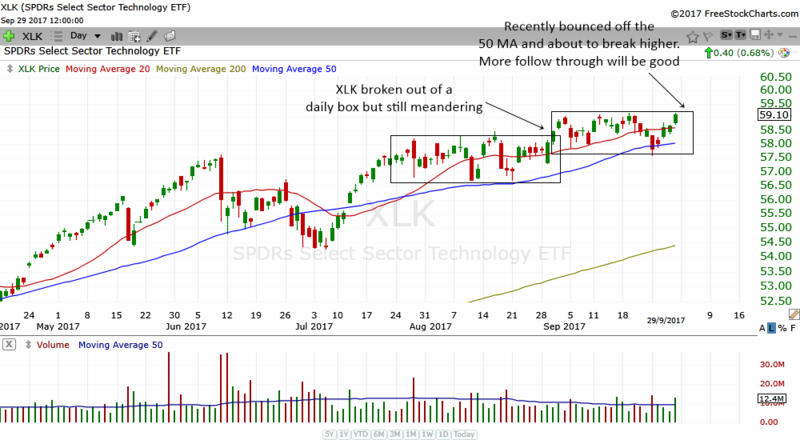 Despite the meandering movement of the tech sector, the XLK is actually still in an uptrend and chugging higher slowly. It broke above a box in August but then it drifted sideways. It is trying to break out of another box and recently it found support at the 50 MA. The XLK is still showing us a picture of bullish strength as it makes higher highs and higher lows. October and November are usually very good months for the tech sector and it is very likely that the tech sector will move higher once it breaks out of the box. A rising tech sector is also very good for the health of the stock market. The consumer discretionary sector is often used to gauge whether the public has excess money to buy things they don't need. In times of prosperity, people tend to have more cash and when they have more cash, they tend to spend money on things that they don't really need. Like the Netflix subscription or the nice expensive handbag. 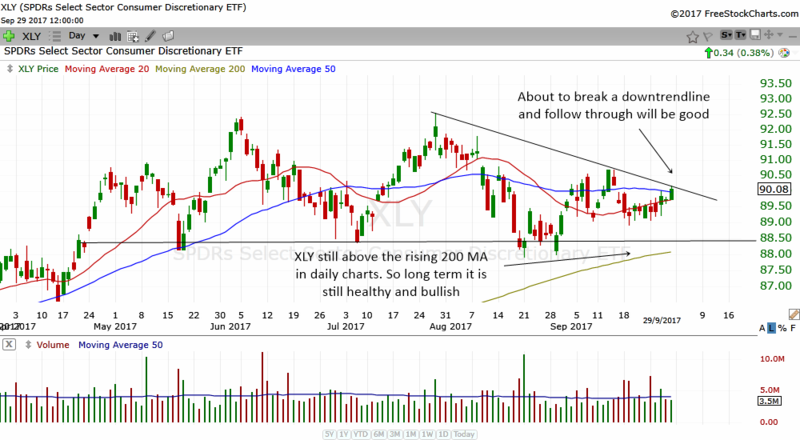 The XLY has been moving up and down a lot recently but since it is staying above the rising daily 200 MA, the XLY is still considered healthy in the long term. It may be trying to break above a recent downtrendline. A break above the trendline will be very good and will most probably send it higher. I'm looking at another sector which is the health care sector. I'm not very sure if a rising health care sector is any benefit to the US stock market or it may just be health care stocks are making more money because of the rising health care cost. But anyway I'm just putting it here to show you that this sector is another area where you can benefit. 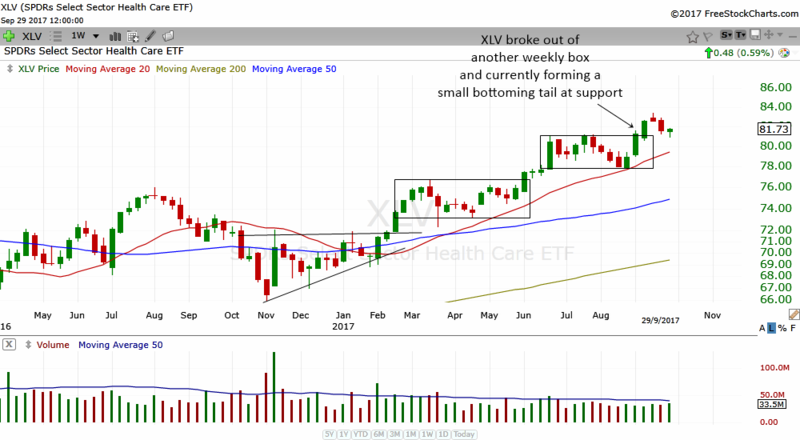 The weekly chart of XLV above shows that the healthcare sector is in a nice bullish weekly uptrend. It recently just broke above a box and corrected to the top of the box. 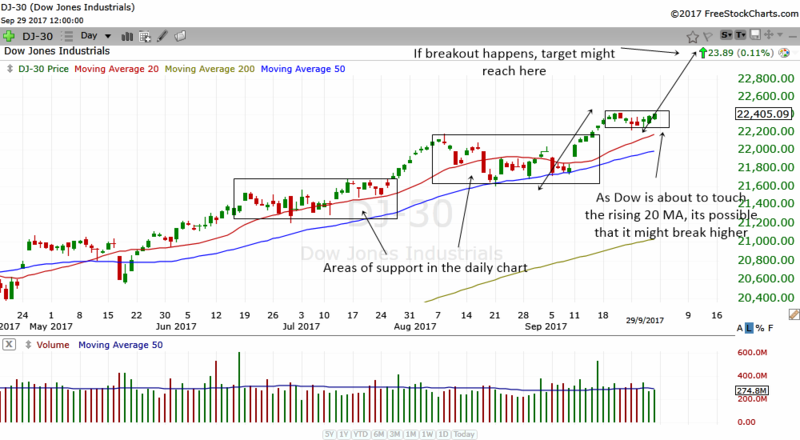 Since the sector is in an uptrend, it is very likely to continue moving higher. Oil had a really nice run up after it broke a daily downtrendline. However, there is immediate resistance ahead. Gold has also run up nicely and broken above a box but recently it corrected back to support. One thing that the trader needs to take note is that Oct and November have not been particularly good for oil and gold in the last 5 years. The above is the seasonality chart for light sweet crude oil. It is a good example for traders that we should not attach too heavy a weight to seasonality. 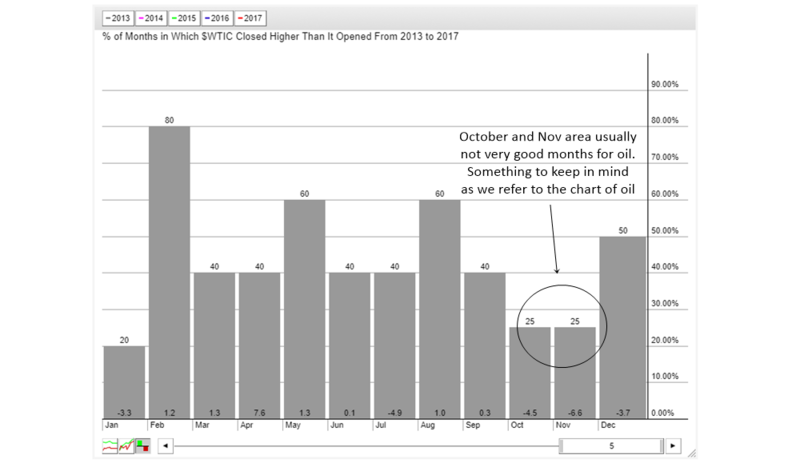 The month of September 2017 saw how oil had a really nice rally up despite being historically not favorable to oil. The trader should always put trend and price analysis and then only supplement his or her analysis with seasonality patterns. When all 3 are in sync it gives a powerful punch. But if they diverge and disagrees, price and trend always rule. I would like to point out that for the past 5 years, oil has had big declines in October, November and December. If you look at the seasonality chart above, you will realize they are some of the biggest monthly declines in the past 5 years. October and November has been particularly negative for oil as they only closed higher 25% of the time. I won't take this as a death sentence for oil but with oil reaching an area of resistance I would be more cautious. We still have to analyze the smaller time frames in oil like the 60 min charts to have a better picture. The chart of oil above shows us how oil rallied after it broke a downtrendline. If we take the measured move and project it upwards, it is almost at resistance area. Oil has almost met the target. I would expect at least some sideways consolidation even if there is no correction. Do check my Daily Stock Market Analysis each day as we tackle and analyze oil in the shorter time frames. 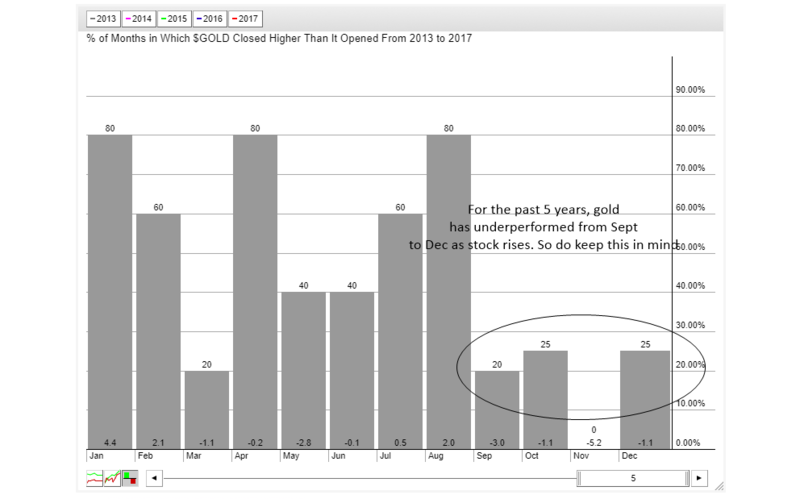 The above is the seasonality chart of Gold. One glance at it will show you the end of the year period is absolutely not conducive for Gold bulls. Part of the reason is because of the good rallies and bull runs in the stock market for the past 5 years from Oct to December. Investors tend to dump Gold when the stock market rallies. With that in mind let us look at the chart of Gold below. Gold has broken out of a trading range in August. Recently it corrected back to the support area. It tried to bounce up once but immediately failed and currently it is still correcting. We will have to look at the 60 min chart to see if there is a concrete bottoming in the 60 min chart before we can say that the daily support will work. This is one long analysis, but I do hope it helps to bring light to the current stock market situation. This is also a small part of intermarket analysis that I'm doing. Every day, every week and every month that passes give us more and more information to digest and analyze. Although this analysis is not extensive, it does show us that the stock market is poised for more gains in the near future. Do read my Daily Stock Market Analysis for updates each day.